Once again, in July was the meeting of the US Federal Reserve and again, the intentions of the monetary authorities on the timing of raising interest rates were not clarified. Based on the semantic analysis of the press-release were reinforced the views that the rate will be raised at the next meeting in September. Meanwhile, the analysts of Fort Financial Services note, before the July’s meeting the probability of rate increase was 41%. By the end, the probability was already 45% however, below 50%. At the moment however, is estimated a rate hike in autumn as well as retention at the same level. The Federal Reserve is taking steps to reassure markets that the rate increases will take place in the current year but shows unavailability of accurate benchmarks. Indecision of the Federal Reserve is caused by the current state of the economy of the United States. According to published reports, the US unemployment rate dropped to a normal level, moreover, the number of vacancies increases with an enviable stability. Together with the decreasing unemployment rate is raising the risk of inflation increase. It must be pointed out that since the second half of 2014 these risks were compensated by the falling prices of the “black gold”. Most probably, this factor will be completed by the end of the current year. The natural unemployment rate, in the long term, is estimated by the Federal Reserve at 5.0-5.2%. It should be mentioned that the value is close to these figures as it currently is 5.3%. The main event of this week, with no doubt, is the report on the labor market in America. On Friday is scheduled the publication of the Ministry of Labor’s report on employment for the last month. Traditionally, this report is investors’ main focus. The interest to it is increased after the meeting of the Federal Reserve last week. Authorities of the Central Bank of America announced that the increase of interest rates depends on the improvement on the labor market. In July is expected an increase in jobs’ number by 215 000. It should be noted that economists consider a high rate of employment growth figures above 200 000. On Wednesday is scheduled the issue of ADP employment report for the last month. Earlier, in May and June, the data showed acceleration in jobs formation. Technically, this looked like a growth rebound from the line of the upward trend during the last 5 years, to which there was a decrease of the indicator in April. ADP’s publication on Wednesday may show a further data growth. In this case, the US currency, probably, will strengthen slightly against majors since the hope for the Friday’s report will be reinforced. More important may be the data related to the prices pressure based on wages. The fact that the Federal Reserve keeps the possibility of interest rates increase in the first month of autumn indicates its desire to move to the tightened monetary policy this year, say the analysts of FortFS. This week, the main role is given to the data on inflation, wages and employment of the US population. Of interest is also the published data of PCE and ISM. In anticipation of these publications the quotations on EUR/USD are decreased. How events will affect the rate of EUR / USD will be reflected on the site. MACD is in the negative zone and below its signal line. According to the indicator it is possible to open positions only in short. Stochastic oscillator is in the neutral zone. % K line crossed the% D line from top to bottom. According to the testimony of the indicator was formed the signal to open short positions. The fall of the pair is constrained by support at 1.0890. 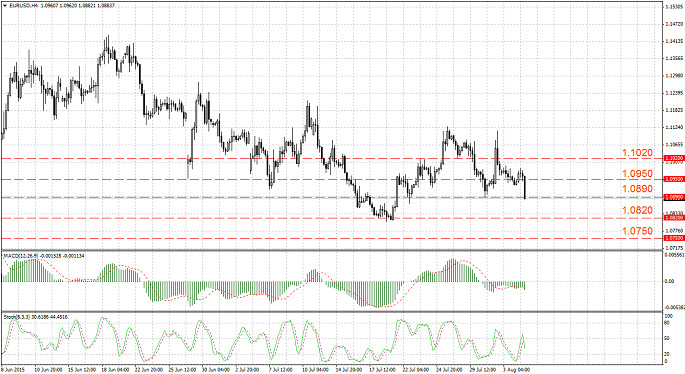 If bears manage to break through this support then the decrease will continue aiming to 1.0820 and 1.0750. The growth of EUR / USD is limited by resistance at 1.0950. Its breakthrough would open the way to the level of 1.1020.